Toyota unveiled its RAV4 rally car at the Monster Energy Supercross Championship finale this weekend at Sam Boyd Stadium in Las Vegas. Ryan Millen, who won the 2014 Baja 1000 in a Toyota Tundra TRD Pro, will drive the RAV4 rally vehicle at various rally races including some of the 2015 Rally America 2WD-Open Class season. The muscled-up RAV4 was unveiled live between races to all in attendance and was on display in the pits throughout the event. A RAV4 competing within a professional racing series is rare. It is even rarer to see the unibody-construction, Small-Sport Utility Vehicle (SSUV) go head-to-head with Rally America’s modified street cars. 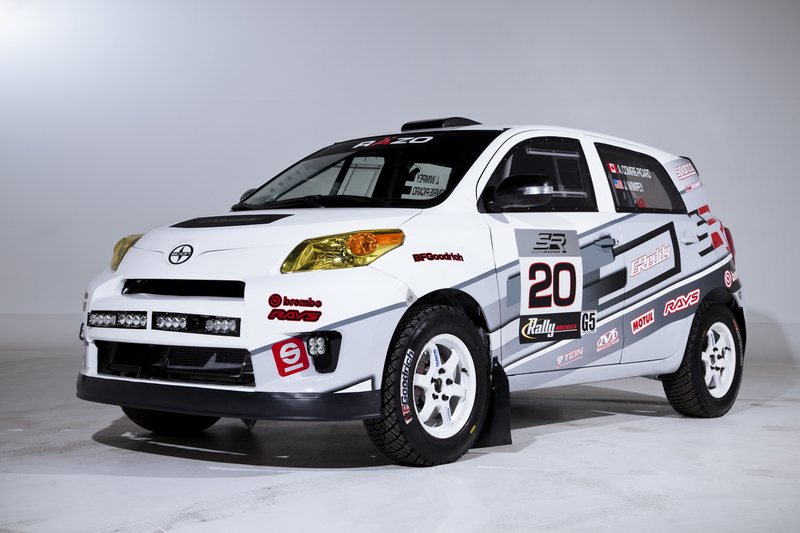 Toyota’s entry into Rally America is a modified 2015 Toyota RAV4 LE. The vehicle sports a stock transmission and a stock 2.5-liter, four-cylinder, double-overhead cam engine that pushes 176-horsepower and 172-pounds of torque. Millen and his crew removed more than 500 pounds of stock weight, while adding a roll cage, BFGoodrich all-terrain DOT 215/75R15 tires, and upgrading to a front and rear TEIN suspension. The RAV4 literally created the SSUV category when it was introduced by Toyota in 1994. At that time, the notion of a unibody construction Sport Utility Vehicle (SUV) was unheard of. Since its introduction, unibody-construction SUVs have become a standard offering across the automotive industry. While widely known as a practical version of the more-cumbersome SUV, RAV4’s lighter and leaner design allows it to perform and handle quite effectively for desert, beach and other outdoor excursions. It’s for this reason that Toyota is showcasing the RAV4 so dynamically in the form of this entry in the Rally America Series. Son of off-road legend Rod Millen, Ryan Millen has been involved in Toyota Racing since childhood. From chasing for Ivan Stewart and racing in MTEG Stadium races at nine-years old, to racing the FJ Cruiser in the Baja 1000, he has poured his life and professional racing career into Toyota. Millen Adventures will be entering into numerous races including some of the Rally America West Series where he’ll be competing in the 2WD stock class with the rally built Toyota RAV4. For nearly three decades, the Toyota 4Runner mid-size SUV has been a stalwart for off-roading enthusiasts seeking a SUV with rugged, go-anywhere capability. Currently In its fifth-generation, 4Runner continues as one of the few fully capable mid-size SUVs, and the redesigned 2014 4Runner receives a rugged new exterior design, and interior refinements that add comfort and convenience without sacrificing its hallmark performance capability and excellent value. The 4Runner combines rugged body-on-frame construction with comprehensive suspension technology that yields optimal off-road capability with a smooth ride and comfort more often associated with crossovers. The 2014 4Runner is available in three grades: a well-equipped, value-driven SR5; top-of-the-line Limited, and a Trail grade for those who want maximum off-road capability. Optional third-row seats on SR5 and Limited allow for up to seven-person capacity.4Runner owners will have the choice of a rear wheel 4×2, part-time 4×4 or a full-time multi-mode 4×4 with a locking center differential. All models are equipped with a powerful 4.0-liter, 270-horsepower V6 teamed to a five-speed ECT-i automatic transmission and one of the few vehicles that continues offer a transfer case. The refreshed 4Runner features a redesigned front fascia that conveys a more rugged and aggressive appearance. This includes a muscular front grille, and edgier smoked headlamps for a more forceful look. The SR5 and Trail grades feature a color-keyed grille insert and front bumper that is surrounded by fog lamps set in sharply cut inlays that extend from the headlamps down to the bumper. The Trail grade features new color-keyed bumpers and overfenders, and it continues to be distinguished by an aggressive hood scoop and silver painted front and rear bumper accents. All grades are now standard with a roof rack. In addition to the distinctive new grille, the premium Limited’s front design stands apart with a chrome-plated grille insert and chrome front bumper that extends to the fog-lamp bezels. The side molding, roof rack and rear bumper are also chrome trimmed. The headlamps have also changed from halogen to projector beam, with both the headlamps and redesigned rear combination lamps on all 4Runner grades now featuring LED lamps. Both the SR5 and Trail grades will ride on 17-inch alloy wheels with a new wheel-design for both, while the Limited continues to ride on 20-inch alloy wheels, which are now painted black prior to machining to add contrast. All grades continue to come standard with a full-size spare. The 2014 4Runner will be available in eight exterior colors that include new additions: Super White; Attitude Black Metallic; Barcelona Red Metallic; and Nautical Blue Metallic. They will join carryover colors that include: Blizzard Pearl; Classic Silver Metallic; Magnetic Gray Metallic; and Black. The 4Runner exterior updates are complemented by touches of refinement on the inside. Both the SR5 and Trail grade add standard Soft Touch door trim, and a leather-wrapped steering wheel and leather shift knob provide a premium feel and atmosphere. The SR5 receives a new bright and highly visible Optitron instrument panel that houses speedometer, tachometer, voltage, fuel and coolant temperature gauges, plus a multi-information display that offers multiple functions. An Eco-Driving feedback system allows the driver to monitor fuel consumption in real time. On 4Runner Trail, an overhead console within easy reach organizes the off-road control switches into one location. A compass indicator and outside temperature display add functionality. A manually controlled air conditioning system is standard on SR5 and Trail grades; the Limited features an automatic dual-zone climate-control system. For second-row passengers, a sculpted front seat-back shape provides additional knee space. The second-row seats, which include a center armrest, individually recline up to 16 degrees in four steps for relaxing passenger comfort. The 40/20/40 second-row seat configuration also has a one-touch walk-in function, making access to the third row easier. Third-row seating is available on SR5 and Limited grades and features a roomy, supportive seating area. The SR5 and Trail grade come standard with comfortable fabric-trimmed seating available in Sand Beige, Graphite or Black. Available SofTex seats offer a soft, rich feel. New for 2014, the SR5 adds a standard eight-way power driver seat. The Limited comes standard with a leather-trimmed interior with new ventilated driver and front passenger seats in Sand Beige, Black and a new Redwood color. Front seats are also heated with eight-way power-adjustable driver’s seat with power lumbar support and four-way power-adjustable passenger seat. Both front seats are now standard with memory settings. The 4Runner 4.0-liter V6 generates 270 horsepower and 278 lb.-ft. of torque. Dual independent Variable Valve Timing with intelligence (VVT-i) optimizes torque across the engine’s operating range. Fuel economy ratings rival some crossover SUVs with an EPA-estimated 17 mpg city and 23 mpg highway for 4×2 models, and 17 mpg city and 22 mpg highway for 4×4. Maximum towing capacity is 5,000 pounds and all vehicles feature an integrated tow-hitch receiver and wiring harness as standard equipment. A double-wishbone independent front suspension, combined with a variable-flow rack-and-pinion steering, help give the 4Runner precise control on demanding roads. Coil springs over gas shocks are used at all four wheels for a comfortable ride and controlled handling. The four-link rear suspension maximizes off-road axle articulation, whileproviding a smooth ride for rear-seat passengers on and off pavement. The Limited grade comes standard with an X-REAS suspension system that further improves performance, comfort and control. With X-REAS, 4Runner corners flatter, smoother, and handles choppy pavement more easily. X-REAS automatically adjusts the damping force of shocks when driving over bumpy surfaces or when cornering. The system uses a center control absorber to cross-link shocks on opposite corners of the vehicle, substantially reducing pitch and yaw by offsetting opposing inputs. The 4Runner SR5 and Trail 4×4 models have a two-speed, part-time four-wheel-drive system with neutral position, maximizing fuel efficiency when a 4×4 configuration isn’t needed. The 4Runner Limited is equipped with a full-time, four-wheel-drive system with a locking center differential and a three-mode, center console-mounted switch. The A-TRAC traction control system is standard equipment on all 4×4 models. The system can distribute driving force to any one wheel in contact with the ground, making terrain irregularities and slippery patches virtually transparent to the driver. An electronic-locking rear differential is standard on the Trail grade. The Trail grade is designed to maximize off-road performance with superior approach and departure angles, high ground clearance, and an array of functional upgrades for the most demanding active outdoor enthusiast. The Trail grade offers an optional Kinetic Dynamic Suspension System (KDSS). KDSS significantly improves terrain-following ability by dynamically disconnecting stabilizer bars to allow for more axle travel, and better suspension articulation in slow, difficult terrain. With the transfer case shifted into low range, CRAWL regulates engine speed and output (along with braking force), to propel the vehicle forward or in reverse at one of the five driver-selectable low-speed settings. This allows the driver to maintain focus on steering over rough level ground or steep grades without having to also modulate the throttle or brake pedal. All models come standard with Hill-start Assist Control (HAC), which provides additional control for off-road driving by helping to hold the vehicle stationary before starting on a steep incline or slippery surface. All 4Runner 4×4 models feature standard Downhill Assist Control (DAC). This feature augments the low-speed ascending ability of low-range by helping to hold the vehicle, allowing time for the driver to a target speed with no driver intervention. An array of convenience features and versatile seating configurations provide the 2014 4Runner with ample passenger comfort and utility. Fold-flat second-row seats provide a level load floor in the 4Runner, and it is not necessary to remove the headrests to fold the seats flat. The available third-row seat is split 50/50 and folds flat. The seats can be folded from the side or at the rear, using separate one-touch levers. With this arrangement, more cargo space is available without removing seats, and longer items can be conveniently carried. A Smart Key system featuring keyless entry with push-button start is standard on the Limited grade. The system allows the driver to unlock or start the vehicle by carrying the keyless remote. The cargo door window has jam control, like the moonroof and power side windows. An available pull-out cargo deck is capable of carrying up to 440 pounds to make loading and unloading heavy items easier and to provide seating for tailgating and campsite relaxation. All 4Runner models come standard with a 120V outlet and two additional 12V outlets. A front and rear clearance sonar system is standard on Limited models, and a rear-view backup camera is now standard on all 4Runner models. The system displays in the audio screen, increasing visibility at the rear of the vehicle. New for 2014 on SR5 and Trail grade 4Runner models is Entune™ Audio Plus, which includes Toyota’s Entune multimedia system, an AM/FM/MP3 CD player with eight speakers, integrated SiriusXM™ Satellite Radio (includes 90-day trial subscription), USB port with iPod connectivity, and Bluetooth® hands-free phone capability and music streaming. Standard on the Limited grade is the new Entune Premium JBL Audio system, which incorporates today’s most in-demand connectivity features. It includes the Entune multimedia system, a JBL® premium sound system with navigation, SiriusXM Satellite Radio (with a 90-day trial subscription), HD Radio with iTunes® tagging and 15 speakers. The navigation system includes a large seven-inch monitor. Entune is a collection of popular mobile applications and data services, with three years of complimentary access. Once a smart phone is connected to the vehicle using Bluetooth wireless technology or a USB cable, Entune’s features are operated using the vehicle’s controls or, for some services, by voice recognition. Entune offers mobile apps for Bing™, iHeartRadio, MovieTickets.com, OpenTable®, and Pandora®. Entune data services include a fuel price guide, sports scores, stocks, traffic and weather. The “party mode” rear liftgate speaker audio setting feature has been discontinued as the new updated audio system easily allows the user to shift sound balance to the rear liftgate mounted speakers. The pole antenna has been dropped in favor of a new in-glass antenna. The 4Runner features Toyota’s standard Star Safety System™ that includes Vehicle Stability Control (VSC) with traction control (TRAC), an Anti-lock Brake System (ABS) with Electronic Brake-force Distribution (EBD), Brake Assist (BA), and Smart Stop Technology (SST) brake-override system. VSC helps the driver to ensure control by compensating for front and rear wheel slip. The system uses selective braking and modulated engine output to help keep the vehicle in line with the driver’s steering inputs. On 4×2 vehicles, the Auto LSD (Limited Slip Differential) system allows for better traction on slippery sections of roadway. The four-wheel ABS with EBD provides the 4Runner with optimal brake proportioning, regardless of vehicle load. Eight standard airbags includes front, side-mounted and knee airbags for the driver and front passenger, and side-curtain airbags for the second and third rows. All 2014 4Runners have active headrests for driver and passenger, and three-point seat belts for all seats. The 2014 4Runner Limited offers the Safety Connect™ telematics system. Available by subscription, with or without the optional navigation system, Safety Connect offers four safety and security features: Automatic Collision Notification, Stolen Vehicle Location, Emergency Assistance Button (SOS), and Roadside Assistance. When Safety Connect is ordered, it includes a one-year trial subscription. In case of either airbag deployment or severe rear-end collision, an Automatic Collision Notification system is designed to automatically call a dedicated response center. If a response agent cannot communicate with the occupants, the agent can contact the nearest emergency-services provider to dispatch assistance. Mercedes=Benz G63 AMG in the Dubai desert. For some reason, I’ve always really, really liked driving a Mercedes-Benz G-Wagon. My friends and family, not so much. They think the rectangular, tall-ish shoebox shape and its rather steep price (hey, if you have to ask dept.) vs. the other SUVs on the market doesn’t add up. Chalk it up to faulting function vs. form or vice-versa. They understand that a G-Wagon will really go the places the other nice looking SUVs really can’t, but maybe if it weren’t so ugly – their words, not mine – maybe they’d reconsider. c) having the high-powered version of what appears to be the civilized Unimog come to the United States. The AMG biturbo, 544 hp, V-8 mammoth mill mates to a 7-speed automatic transmission to move the G-wagon with a pickup bed on the back (think of a German Jeep Scrambler and you’re getting close) from 0-to-60 mph in a reported 7 seconds. Toss in that it weighs about 4 tons and that’s mighty impressive. Top speed is said to be over 100 mph. As the name implies, 6×6 means there’s six drive wheels to rival perhaps a Caterpillar tractor for traction, an off-road low-range ratio in the transfer case, and 37-inch tires to aid in ground clearance. The chassis is largely based on the current production setup, chief difference being helical springs and dampers have been adjusted to take account of the changed characteristics of the 3-axle model. The truckness of this uber sport luxo crawler disappears inside with an interior that’s bathed in red or brown designo leather with constrasting stitching. The four bucket seats inside are also top notch offering either hot or cold air ventilation. Price? If you have to ask …. Scion Racing will make its second appearance at the Pikes Peak International Hill Climb June 30, with the FR-S debuting for its first race up the 14,110 foot summit in Colorado Springs, Colo. Now in its 91st year, the iconic and highly competitive event takes drivers up a 12.42-mile course with 156 turns to the top of Pikes Peak. Driver Andrew Comrie-Picard will be in the Scion Racing Rally xD, and Takeshi Aizawa will be piloting the GReddy tC, both making their second trips up the mountain. Driver Robert Walker is a rookie to Pikes Peak and will be behind the wheel of a FR-S built by Evasive Motorsports. All three Scions have been modified for safety and increased performance. Comrie-Picard and Aizawa will be competing in the Time Attack class, while Walker will be racing in the Unlimited class. For more information about the Pikes Peak International Hill Climb, visit www.ppihc.com. Scion Racing also includes teams competing in drag, drift and road racing series. For information, videos and interviews with drivers, visit www.scionracing.com. Going off-road? Do you want the 2013 SVT Raptor or Mars Rover?